William de Brailes is the only 13th-century English non-monastic illuminator known to have signed his work. His surname means 'from Brailes', a town in Warwickshire, about 30 miles north of Oxford. Documentary sources reveal that he lived and worked in Oxford, with his wife Celena, in a bookmaking community based around the present site of the chapel of All Souls College. His distinctive painting style has been recognised in several manuscripts, of which this is perhaps the most important. It is the earliest extant English Book of Hours (a book containing prayers to be said at certain hours of the day), and includes two self-portraits. 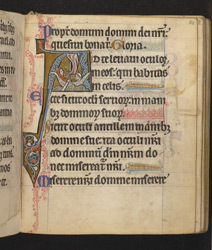 This initial 'A' forms part of a narrative series telling the story of an ignorant priest, who only knew one mass of the Virgin. Here he travels by boat to visit Thomas Becket, archbishop of Canterbury, to tell him that he has had a vision of the Virgin Mary.